While many birds migrate south for the winter, others will not stray far from their typical habitat. 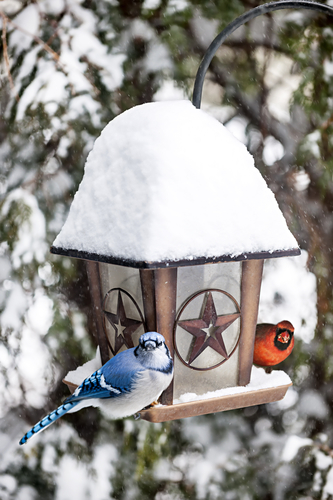 With some assistance from your local garden store, you can not only get birds to come visit your property but also help them survive the cold season. Select Plants: Another best practice to attract birds is to pick up a variety of plantings while you’re at the garden store. It is in the nature of certain birds to be attracted to certain plants, so it makes sense to research which specimens will summon the birds you’re most interested in. For instance, sumac is known to appeal to robins, while oaks appeal to jays. Install Bird Feeders: The number one way to get birds to come to your backyard is to hang feeders, which are often available from your local garden store, along with seed. Feeders are little containers that can hold food, inviting the winged creatures in for a nice meal. Since winter often leaves the ground covered in snow, it can be more difficult for birds to obtain the sustenance they need — that’s where you come in. Just don’t put the feeder too close to the ground since that can leave them vulnerable to predators. Move Your Mulch: Though mulch can be an outstanding asset to your garden by helping the soil retain its nutrients and blocking weeds, too much of it can discourage birds from visiting. Some species enjoy inspecting the ground for worms and other small sources of food. If the ground is completely covered in mulch, the birds won’t bother with your area, so get out a spade and temporarily remove some of the covering for the season. Dundee Nursery & Landscaping has earned a reputation as the premier garden store in Minnesota. With locations in both Plymouth and Hutchinson, you can always get the plants and trees you need, as well as advice on all gardening matters. To inquire about a specific item, just call (763) 559-4004. Learn more about the center by visiting their website.